In 2012, EXIST initiated the Live Art National Network Development project (supported by the Australian Council for the Arts), an online resource launching March 2013 www.performancemap.org This website currently maps the Australian network of practitioners, venues and curators, enabling artists and curators to better connect and work together. In 2013 and beyond in collaboration with software engineer Kerstin Haustein, Performance Map will grow to be a digital mapping of the global performance art, action art live art network from 1975 - present, cataloguing existing archives and online sources. Although multiple sources will eventually be part of this map, the current primary source of archival data is Die Schwartz Larde or The Black Kit www.asa.de, the largest known performance art archive in the world with access provided by Boris Nieslony. The archive element brings into the 3D global map and historical element, a time scaling slide will allow users to look back in time and uncover the evolution of the network from 1975 to present. The archival element is currently still in progress. Performance Map will also function as a live streaming state for performance art, that allows video streaming from Smartphone via the purpose built application. Future events are automatically incorporated into the map utilizing predictive network modelling and various coding techniques. The website will also collect and collate existing performance archives of artists, festivals, email lists, facebook pages etc. 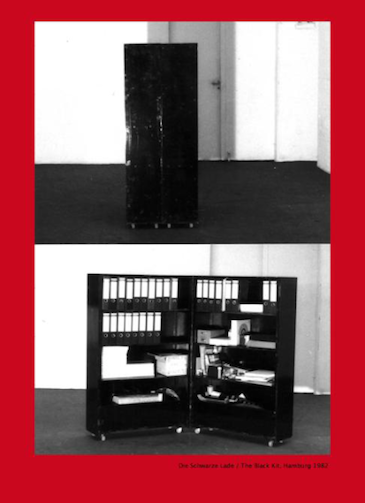 This website seeks not to replicate existing materials or databases such as the National Review of Live Art Archive at Bristol University [www.bristol.ac.uk/nrla], The European Live Art Archive [http://www.liveartarchive.eu] or UbuWeb [http://www.ubu.com/], but rather aims to collate, visualise the data as an accessible and user friendly resource. This paper demonstrates the current operational scale and scope of the Performance Map Live Action Art International Network and discusses future development stages. Is it possible to create a, living, automated, visual, interactive map, streaming channel and archive of an ephemeral art form? That is exactly the task undertaken by the Performance Map project. This paper begins with a brief introduction to the sector of performance art and some insight into the operation of the work and network. This is followed by an introduction to tele-collaboration as a research area, including existing tools. This is followed by an outline of the Performance Map project, including its aims, current state and areas for future development and implementation. Performance art is a niche genre within the performing arts that has seemingly actively sought to evade definition and institutionalisation for decades. A definition by performance art historian and curator Rose-Lee Goldberg states that although the genre defies definition, it may be thought of as 'live art by artists' (1998: 12), although every performance artist approached by Goldberg appeared to have their own personal definition. This definition of performance art relates to the practice of live art and action art; enveloping the key elements of the practice which are experimental, experiential and ephemeral (Goldberg, 1998; Phelan, 1993). Performance art emerged around 1960 from the work of the Viennese Actionists, as well as from the cultural movements of Futurism, Dada, Fluxus and experimental theatre (Goldberg, 2004). There is a long tradition of community involvement and political activism in performance art, with a focus on humanitarianism, activism, and the live moment (Goldberg, 1998; Phelan, 1993). Unlike traditional forms of performance which infer the imaginary, the pretend, or surreal, performance art is essentially stripped of façade, with many artists looking to the real and the ritualistic for sources of meaning and connection (Berghuis, 2006; Goldberg, 1998). This opting for the real moment of meeting via ephemeral contact is often preferred by performance artists as such an environment may allow space for metaphysical transformation (MacLennan, 2004). Performance art practices today are in some ways similar to those that took place in this field over fifty years ago, as many of the symbols, materials, and intentions are still in high circulation. This may be seen through the work of Alastair McLennan, Boris Neislony, Esther Ferrer and Rocio Boliver among others. One major change is that of technology, with some artists embracing the much potential that it avails. One particular example of the acceptance of technology is the artists' use of the internet and other telecommunication/tele-collaboration tools. In the 1990s, with the growth of the internet, performances went online with artists utilizing online free ware to broadcast their works. Some artists began making personal websites and uploading documentation images and video streaming on their sites, so their performances can be viewed at the viewer's leisure. The digital storage of large amounts of data has enabled digital archives such as the National Review of Live Art held at the University of Bristol (Bristol, 2012) the Routledge online archive (Routledge, 2013) and even the topical Performance Map (EXIST, 2013) to proliferate. This innovation enables geographically isolated performance artists to present and promote their works online. In the past decade, sites using online freeware such as 'Ustream' and 'Skype' enabled artists to present their work 'live' although they may not be geographically present. Examples of such presentations include works by Colm Clarke who was involved 'exist-ence: performance art event live, film, art-i-fact' hosted by EXIST in Brisbane, Australia January 2010. In this instance, the online freeware Ustream was used to send live images of his performance in Belfast, Ireland to a venue in Brisbane (Cunningham, 2010a). Examples of online promotion can be seen in countless event pages on Facebook and Myspace and other social networking sites set up by artists, allowing artists to see each other's work and build relationships without having to rely on local contacts. Although performance art places a priority on the live exchange, there continues to be much talk among practitioners regarding the documentation of events so that they are not lost 'into the ether', but are maintained through some trace of what occurred (Wheeler, 2003: 497). Some examples of online archives that serve this function include UbuWeb (UbuWeb, 2010), NEW MOVES INTERNATIONAL (International, 2010), Performalogica (Performancelogia, 2010), Indonesian Art Digital Archives (I. V. A. Archive, 2010), New Museum (New Museum Digital Archive, 2013) and Agor8 (McBride, 2010). The combination of globalisation, the blurring of geographical and political bounds (such as the formation of the EU, collaborative efforts in Asia and Latin America) coupled with the competitive costs for air travel has allowed for a greater level of transitivity between artists thus facilitating a cross-pollination of the practice around the globe. In addition to the performance art network sharing practice and praxis, the global performance art network operates as an informal knowledge network. Knowledge networks allow for the exchange of information to be offered and received, flowing back and forwards between partners (Owen-Smith and Powell, 2004). In addition to participating in real time performances, performance artists communicate with each other about events, share information online via social networking websites and personal artist and event web pages, as well as through email lists that are free to join, and easy to gain access to (EXIST, 2013). Many opportunities, such as call for works, calls for contributions, information on scholarships or international funding schemes, are posted in these various locations (EXIST, 2013). Some lists, which are arranged by organisations, such as FADO and New Work Network, are sent out at regular intervals. Others, such as the LIVEART LIST, operate on an individual basis. If an artist wants to advertise their upcoming performance, or wants to find out contact details for another member of the network, they simply send an email to that list and it is automatically posted to hundreds of subscribers instantly. These immediate connections make maintaining relational ties within the network expeditious and simple. This is not unique to the global performance art network as other networks too have experienced the effects of digital communication increasing connections between communities (K. Hampton and Wellman, 2003). The primary method of communication remains at the event, face to face, as festivals and events also play a significant role in the maintenance of the network. These live meeting of artists, some known, and some only known via online communications, sparks connections that had previously only been potential or dormant contacts. Due to the cost of transcontinental travel, however, both fiscal and environmental, the collective EXIST started to include more interactions and performances that could be experienced virtually - via live streaming. Colm Clarke was the first [Northern Ireland], Lady Kitt [UK] and Lablana Babylon [USA] in 2013. EXIST is not alone by any means in the shift (e.g. Dimanche Rouge, Paris has an ongoing streaming program, and many artists present via UStream and other such channels). Nevertheless, this move was an impetus to launching Performance Map as there was a desire to have a platform that would enable and encourage such live streaming, a platform that would be more interactive that would allow for collaboration across geographical spaces. A field of research growing increasingly popular in computer science is tele-collaboration system design, which aims to support geographically distributed interactions between individuals and groups to achieve common agendas (Abler and Wells, 2010). In our case, the research applies to a collaboration of performance artists with (potentially) worldwide artists and a worldwide audience. The challenge for this area of research is in supplying the system users with enough information so that the physical separation minimally inhibits the experiences of the remotely located users. In the application of Performance Art there is a challenge, not just that information may be lost, but artistic experience as well. Tele-presence, or presence, is the goal state of tele-collaborative systems, where a system user feels physically present at a distant location (Sheridan, 1989; Lee and Kim, 2008). User experiences with these systems can be measured in terms of mental and sensory (physical) immersion. Mental immersion is the state of being completely engaged within an environment insofar as the user experiences a sense of presence within that environment (Sherman and Craig, 2003). The goal of this immersion is to create the illusion that the user is physically displaced elsewhere, misleading their senses (Sylaiou et al., 2010). Studies by the Commonwealth Scientific and Industrial Research Organisation - CSIRO (James et al., 2011) compared a large flat screen to a four metre hemispherical dome to examine the experience of immersion. In this case the presence was defined in terms of a perceptual illusion of non-mediation. This illusion occurs when the user does not perceive the medium and responds as though the medium does not exist. Results suggested the dome screen was more effective, although results were not statistically significant due to the small scale of the study. The inference made was that the dome may have increased the experience of immersion and presence using this perceptual illusion of non-mediation, although further confirming studies would be required. There are a number of methods for measuring presence. The most common method is questionnaire-based post experimental reports, although the scientific demand for objective measures demands the use of measures such as task performance, as deemed to be associated with the degree of presence experienced by the user. It has been suggested that three measures help to enable achievement of a high level of presence in user interactions with a system. The system should be natural, efficient and appropriate to the task goal (Stanney et al., 2003). The task goal in our case is performance art. Sacau et al. (2008) suggested that presence being a subjective mental phenomenon, an important role must be played by psychological factors in an experience of presence. After reviewing the role of individual factors in presence, their conclusion was that despite the claim by numerous authors regarding the need for empirical evidence to understand this relationship, very little actual empirical evidence exists that can be used. 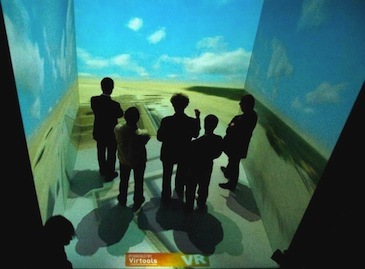 A number of technologies have been developed by researchers to improve tele-presence, including Head Mounted Displays (HMD) and the CAVE (Cave automatic virtual environment) system, which is a four-walled closed unit that the user sits inside with projections on all walls to create the illusion that the user is present in another location, as shown below. Studies have shown that environments like the CAVE system, providing greater spatial presence in highly immersive environments, improve user task performance (Arns, Cook and Cruz-Nera,1999) over desktop displays and other displays lower in immersive qualities such as the Head Mountable Display. The studies compared these environments in terms of performance using virtual worlds rather than a video recording of the real world. Alem's (2009) work in tele-collaboration demonstrates the sense of presence that is introduced using video mediated spaces. Physical presence was examined in terms of a specialist doctor working remotely via a video-based tele-health system. The sense co-presence, the experience that both individuals are in the same place, was also examined using a joint cooperation lego-building tasks. 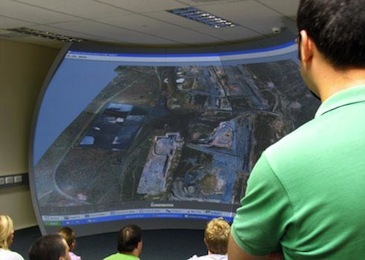 While CAVE systems, hemispherical dome displays and head mounted displays have all been shown to be effective in improving tele-collaboration due to an increased sense of tele-presence and immersion for the user, they are also costly and outside the budget of most performance art productions. Due to the nature of the performance art sector, primarily functioning from small financial budgets, low-cost collaborative tools are required that are free and available for users utilising everyday commercial hardware and devices owned by the general population. Tele-collaboration tools such as social media have, in this decade, become a part of everyday life. Sites such as Skype, YouTube, Facebook, Twitter and LinkedIn provide very simple tele-collaboration tools, as do mobile phone application equivalents. Tele-collaboration tools are becoming ubiquitous in many workplaces, in office-based forms such as MeetingPlace, or more industry-tailored forms providing additional functionalities such as tele-operation for the purposes of controlling remote equipment in industries such as mining, where close proximity to equipment is considered dangerous and/or expensive. Despite the nature of performance art and the desire to remain in the live moment, live in the flesh, there is a responsibility to move toward alternatives. This requires workable alternatives suitable for performance and live art practitioners. Current existing tele-collaboration platforms seem to be very good for the purposes of social networking or achieving structured tasks, but there seems to be a lack of tools tailored specifically for tele-collaboration between artists. The aforementioned studies have showed that immersive environments can assist with the experience of being in the same place, and can hence help task effectiveness. One might expect greater immersion than is available from tools such as Skype could assist in the delivery of performance art across great distances, using everyday devices, rather than the requirement for specialist or expensive technology. While the Performance Art platform will not be a completely immersive environment like the CAVE, it is designed to bring as much immersion to the experience as feasible with everyday personal devices. The next release looks at merging a mobile phone and tablet apps with the Performance Map website, with the potential of multiple mobile phones being able to contribute to the immersive experience at once. In the 21st century we are becoming more and more familiar with such environments, as handheld devices become like extensions of our being, the time spent at computers etc. The speed at which change takes place moves into some hyper reality (Virilio, 1986, 2009), within which there is a normality of the multiplicitous self being presented in a variety of media. As such we are becoming more able to consume media whereby there may be the existence of multiple selves [multiple bodies] (one in one time and space, another virtual, and another an archive). a networked performance that critiques telepresence in the Internet age. With the use of ubiquitous technology such as a webcam, HDTV and Skype, the piece challenges our notions of tele-presented truth through cues of current sensitized perceptions in new media and live art. It forces the viewer to reconsider their presumptions and to some extent, the validity of representation and presence in technology' (EXIST and Batol, A, 2013). The artist is present and as he begins to move and the delay takes form, multiple forms develop and are apparent to the viewer who is watching in real time and real space. This ability to consume such multiplicities is a relatively recent phenomenological norm. We propose integration of a number of these everyday technologies for the purpose of tele-collaborating for performance art, such as video/audio feeds, visuospatial information provided on maps and timelines using GPS and handheld devices for portable applications. This integration into a concise central platform for performance artists would potentially provide a tool to best close the distance gap between international artists and audiences. The Performance Map website is proposed as a central repository, collaboration and social media tool for performance artists worldwide. The goal is to provide access to a 4D Worldwide performance art map, providing spatial, chronological and historical information regarding live-streamed performances. Devices such as Smartphones and Tablets have been identified for carrying out activities that require a portable interface, such as collaborating via video streaming from handheld device. This website currently maps the Australian network of practitioners, venues and curators, like the 'exist-ence' festival curated by EXIST, tagged here. Performance map aims to make it easier for artists to find event curators and for event curators to connect with artists aiming to enable networking in the nicest possible way. 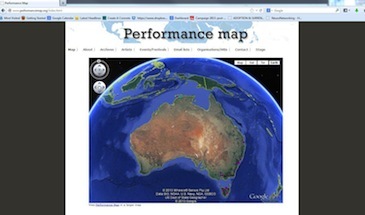 As you can see, performance map currently uses Google Earth for the geospatial mapping component. The website also aims to collect and collate existing performance archives of artists, festivals, email lists, facebook pages etc. Presently most of this data is entered into the system manually by system administrators. However, future plans include a login component for users that allows them to enter their own data into forms and upload video files, with a view towards adding a customisable look-and-feel to the performance video display, a virtual stage design. Possible interfaces with other social media and websites like Facebook and YouTube could also be considered. An example future scenario would be that the performance artist/user would log into the system using their credentials, and enter details of an event, which could be either live-streamed over the site and/or live for viewing at the physical location. This event would then be posted by the performance map website to the map in time and space, with a link to the event URL or relevant stage if the performance is currently streaming on the site or about to begin. 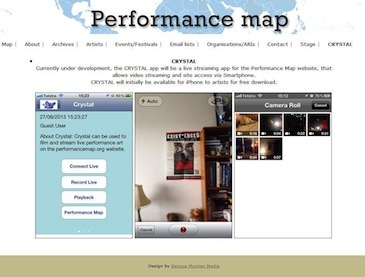 Performance map offers a live streaming stage for performance art, that allows video streaming from Smartphone. This Smartphone application is available to artists for free download. While Performance Map offers a third-party platform 'Bambuser' for this live streaming from Smartphone tool, the proprietary mobile application, still under development and trial stages, will offer an integrated video streaming, GPS, map and mobile site access, allowing users to log into their own accounts and archive their video performances on the Performance Map site. The release of the application is planned for late 2013. The following image contains screen captures from the prototype iPhone application, as displayed on the Performance Map site. 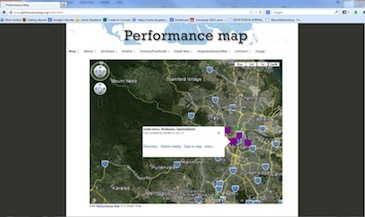 The Performance Map website was officially launched mid-2013 and the mobile application under development and trialling is set to launch by late 2013. The project has faced challenges, both technical and resource-related, and in some cases interim third-party solutions have been investigated. The data for the Performance Map archive was collected in-situ from the largest known performance art archive in the world Die Schwartz Lade coordinated and maintained by Boris Neislony, currently residing in Köln (often spelt as 'Cologne' in English), Germany (www.asa.de). The Die Schwartz Lade or The Black Kit was first created in 1981 after the first council meeting 'Die Konzil' organized by Boris Nieslony, Carola Riess and the Künstlerhaus Stuttgart. This meeting was the first official creation of European network. Forty artists were invited with 70 in attendance, half of whom were European. Subsequent to this event, a kit, container, 'ark of the covenant' was made, which travelled to each meeting until 1998. This covenant was made so that rather than making catalogues of each meeting, artefacts were added to this quasi-time capsule. 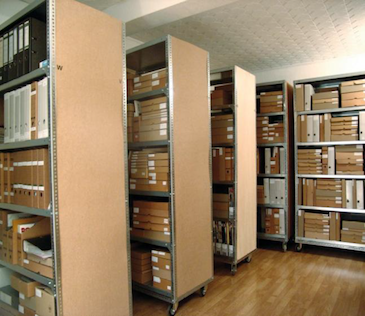 In time, the archive became so large that it was retired from touring and became a private archive with Boris Nieslony as the primary caretaker. Although the archive was taken on by a private institution in the early 2000s for a short period, The Black Kit is now situated in a basement in Köln with Boris Nieslony overseeing. It consists of an analogue archive of approximately 24 bookshelves which amounts to approximates 200 meters of shelved data. Digital archives of over 3600 participating artists, alongside books, images, artefacts, t-shirts, posters, diagrams, audio tapes, records, CDs, catalogues, slides, photos and memorabilia in a number of different languages are organised by artist, by performance type and by country (Nieslony, 2009). In June-July 2010, with the aid of one scanner and laptop, 1000 documents dating from 1975 - 2010 were digitally scanned and saved. Due to the size of the archive itself, in addition to time and resource constraints (one person, four weeks, one scanner, one laptop), only a small portion of the archive was examined. This will be the starting point for the digitised archive within performance map. Further discussions are underway with Boris Nieslony regarding ongoing digitisation of the whole archive. It is envisioned that the 3D Earth Map will provide a four-dimensional time scale for the audience to view performances and past and future schedules, with both the historical performances archived available to view and schedules and locations of future shows also displayed. Potential implementations include a bar to scroll through time in addition to exist controls to navigate the Earth in 3D, so that the user can explore performance art via a geographically and time-dispersed library, selecting a performance based on its four dimensional coordinates. The auto-archive function of Performance Map will be designed so that live streaming performances, on permission of the artist, will be archived to the Performance Map library, and contribute to the archive. These performances will be saved to the site and retrievable from the library by other users. The challenges faced with this goal will include sufficient server storage space and potential recording limits, and artistic, ethical and lawful issues relating to content moderation. Abler RT, Wells IG. (2010) 'Distributed engineering education: Evolution of the tele-collaboration stations for individualized distance learning'. IEEE Trans Educ 2005: 490-96. Available from http://ieeexplore.ieee.org/xpls/abs_all. jsp?arnumber=1495657 [Retrieved 30 October 2010]. Alem, Leila. (2009) 'Presence in video mediated interaction: case studies at CSIRO'. Harrison S, Ed. Media space: 20+ years of mediated Life. Australia. Arns Laura, Cook D Dianne, Cruz-Neira Carolina. (1999) 'The benefits of statistical visualization in an immersive environment'. In: Proceedings of IEEE Virtual Reality, Houston, USA. Arthur Kevin. (2000) 'Effects of field of view on performance with head- mounted displays.' Ph.D. [unpublished dissertation], Chapel Hill: University of North Carolina. Barfield Woodrow, Hendrix Claudia, Bystrom Karl. 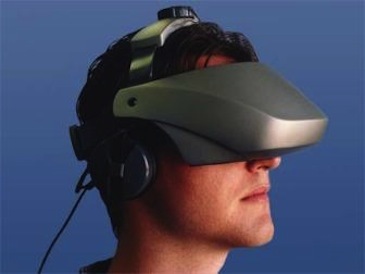 (1997) 'Visualizing the structure of virtual objects using head tracked stereoscopic displays'. In: Proceedings of the Virtual Reality Annual International Symposium, Albuquerque, USA. Berghuis, Thomas. J. (2006). Performance Art in China. Hong Kong: Timezone 8 Limited. Bristol, University of (2012). 'National Review of Live Art'. Available from http://www.bristol.ac.uk/nrla/ [Retrieved 28 November 2012]. EXIST, & Batol, Alrey. (2013). Aggregates. Available from http://vimeo.com/73603478 [Retrieved 29 June 2013]. EXIST. (2013). 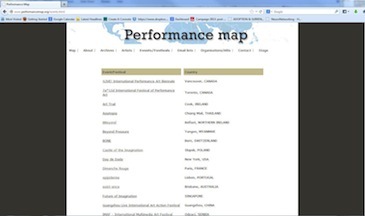 'PerformanceMap'. 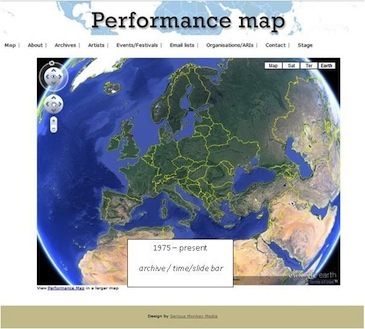 Available from www.performancemap.org [Retrieved 21 April 2013]. Goldberg, RoseLee. (1998). Performance: LIVE ART SINCE THE 60s. London: Thames & Hudson. Goldberg, RoseLee. (2004). 'One Hundred Years.' In A. Heathfield (ed.) Art and Performance: LIVE. London: Tate Publishing, pp. 176-181. Gruchalla Kenny. (2004) 'Immersive well-path editing: Investigating the added value of immersion.' In: Proceedings of IEEE Virtual Reality 2004, Chicago, USA. Hampton, Keith & Wellman, Barry. (2003). 'Neighbouring in Netville: How the Internet Supports Community and Social Capital in a Wired Suburb'. City & Community 2/4: 277-311. Indonesian Visual Art Archive (2010). 'Indonesian Visual Art Archive', www.ivaa-online.org/archive. [Retrieved 21 April 2013]. James, Craig, Haustein, Kerstin, Bednarz, Tomarz P., Alem, Leila, Caris, Con and Castleden, Andrew (2011) 'Remote Operation of Mining Equipment Using Panoramic Display Systems: Exploring the Sense of Presence'. In: The Ergonomics Open Journal 4 (Suppl2-M5): 93-102. Lee Sangyoon, Kim Gerard Jounghyun. (2008) 'Effects of haptic feedback, stereoscopy, and image resolution on performance and presence in remote navigation'. In: Journal Human Computer Studies 66: 701-17. MacLennan, Alastair. (2004). 'Rain Rein Reign'. In: A. Heathfield (ed.) Art and Performance: LIVE. London: Tate Publishing, pp. 232-241. McBride, Kenny. (2010). 'agora8.org contemporary art histories from Eastern Europe', http://www.agora8.org/reader/Kenny_McBride_Intro.html [Retrieved 21 April 2013]. New Museum Digital Archive (2013) 'New Museum Digital Archive'. Available from http://archive.newmuseum.org/ [Retrieved 10 September 2013]. Nieslony, Boris. (2009). 'Die Schwarze Lade' 32. Available from http://www.asa.de/asa_broschure.pdf [Retrieved 21 April 2013]. Nieslony, Boris. (2012). 'Black Kit'. Available from http://www.asa.de/topical/asakompass.htm [Retrieved 21 February 2012]. Sheridan TB. (1989) 'Telerobotics'. In: Automatica 25/4: 487-507. Sacau Ana, Laarni Jari, Hartmann Tilo. (2008) 'Influence of individual factors on presence.' In: Comp Human Behaviour 24: 2255-73. Sherman William R, Craig Alan B. (2003) 'Understanding virtual reality: interface, application, and design'. Elsevier Science, USA: Morgan Kaufman. Stanney Kay M, Mollaghasemi Mansooreh, Reeves Leah, Breaux Robert, Graeber David A. (2003) 'Usability engineering of virtual environments (VEs): identifying multiple criteria that drive effective' VE system design. In: J. Hum Comp Stud 58: 447-81. Sylaiou Stella, Mania Katerina, Karoulis Athanasis, White Martin. (2010) 'Exploring the relationship between presence and enjoyment in virtual museum'. In: J. Hum Comp Stud 68: 243-53. Performancelogia. (2010). Performancelogia. Available from http://performancelogia.blogspot.co.uk/ [Retrieved 5 March 2013]. Phelan, Peggy. (1993). 'Unmarked: The Politics of Performance'. London: Routledge. Routledge. (2013). 'Routledge Performance Archive'. Available from http://www.routledgeperformancearchive.com/ [Retrieved 05 March 2013]. UbuWeb (2010) 'UbuWeb'. Available from http://www.ubuweb.com [Retrieved 5 October 2010]. Virilio, Paul. (1986). Speed and Politics: An essay on Dromology. Trans. M. Polizzotti. New York: Semiotext(e). Virilio, Paul. (2009). The Aesthetics of Disappearance. Trans. P. Beitchman. Los Angeles: Semiotext(e). Wheeler, Britta. B. (2003). 'The Institutionalization of an American Avant-Garde: Performance Art as Democratic Culture, 1970-2000'. In: Sociological Perspectives, 46/4: 491. Rebecca Clunn [nee Cunningham] is an Australian researcher, curator, sound, and performance artist. Rebecca holds a Bachelor of Music, Performance from the Queensland Conservatorium of Music, Griffith University and Bachelor of Creative Industries 2A Honours, Interdisciplinary from QUT and is currently undertaking a Ph.D. in Business [Griffith University] exploring the operation of trust in the global performance art network. Cunningham is a founding member and co-director of the Artist Run Initiative - EXIST. Cunningham has performed locally and internationally is currently working with EXIST member Kerstin Haustein on Performance Map. She states: 'I see performance art as a way of living utopia in the moment, offering a space of pause, a place for personal meta-physical transformation'.